P.S: The above post is written for ‘Three line tales: Week Forty-Five’ challenge by Sonya, the author of ‘Only 100 Words’ blog. Thank you, Sonya, for hosting this challenge. To read more posts for this event, click here. “Mommy, Look at this picture I shot just now”, said seven-year old Ethan beaming proudly showing a photo in his Dad’s cell phone to his Mom. “Wow!Ethan.You are so talented “,replied Jane encouragingly while looking at the photo keenly . Immediately Jane stormed out of the kitchen to confront her husband about several things: Why he let young Ethan use his cellphone, why he is secretly smoking instead of helping her to prepare for Ethan’s birthday party in the evening, and most importantly, why he started smoking again after he sounded so sincere when he promised her that he will never smoke again just a week ago. 2. ‘Three line tales: Week Forty’ challenge by Sonya, the author of ‘Only 100 Words’ blog. Thank you, Sonya, for hosting this challenge. To read more posts for this event, click here. “Dad, Let’s go boating”, his elder son shrieked with excitement. “First I want ice cream”, his younger son demanded. “Let’s walk over the bridge and visit the museum before it closes”, his wife suggested. “Terror Calling..Terror Calling..” beeped his cell phone. His boss whom he had nicknamed as “Terror” in his cell phone was calling him on the weekend. His boss bludgeoned his teammates into staying in office for long hours unnecessarily, and working on weekends for trivial tasks. After several months of slogging in this manner, this was the first time he came out to the park with his family. “Will deal with this on Monday”, he mumbled as he switched off his cell phone and walked his younger son to the ice cream stall. Flash Fiction for Aspiring Writers(FFfAW) .Every Tuesday, we are given a photo prompt and we have to write stories of approximately 75-175 words based on the prompt. Thank you,Priceless Joy, for hosting this wonderful challenge. Click on the picture below to know more details about this event. P.S: The above post is written for Daily prompt :Rearrange. Pumpkin on the kitchen counter…Click..Pumpkin on the plate..Click..Pumpkin with knife on the plate..Click..Pumpkin cut into half..Click..Pumpkin seeds..Click..
“Is my milkshake ready?” ,yelled my husband from the living room. Oops! While I was engrossed taking pictures of the pumpkin in every possible angle, I totally forgot about preparing the healthy oats-pumpkin milkshake that I had coaxed my husband into drinking instead of his morning coffee, half an hour ago! P.S: The above post is written for ‘Three line tales: Week Thirty-Nine’ challenge by Sonya, the author of ‘Only 100 Words’ blog. Thank you, Sonya, for hosting this challenge. To read more posts for this event, click here. Photo by Yinglan Z. Thank you Yinglan . “So much work ahead!”, muttered Reema as she made several trips to the house carrying armful of groceries from the SUV every time. Five years back Reema, her husband, and her two adorable children lived in a rented two bedroom apartment. That year they sold their car and bought a new SUV. Soon, carpooling for children’s soccer and swimming classes brought new friends. Weekend get-togethers started. When their apartment became too small to accommodate all their guests, they bought a single family home. Parties increased, expenses increased and vacations decreased. Reema became busy with shopping groceries, hosting parties, and maintaining the huge house. Though she enjoyed spending time with friends, she craved for some free time which she rarely got these days. “Life was much simpler back then”, she sighed as she recollected her blissful afternoons relaxing on the couch a few years ago. The above post is written for Flash Fiction for Aspiring Writers(FFfAW) .Every Tuesday, we are given a photo prompt and we have to write stories of approximately 75-175 words based on the prompt. Thank you,Priceless Joy, for hosting this wonderful challenge. Captain America was searching for his shield all over the place. Wonder woman had chocolate smeared all over her face. Superman needed a diaper change. Spiderman needed some pocket change. P.S: The above limerick is written for ‘Limerick Challenge Week 43: ‘Celebrations’ .Thank you Rashmi for hosting this challenge . Yesterday it was just another halloween pumpkin. 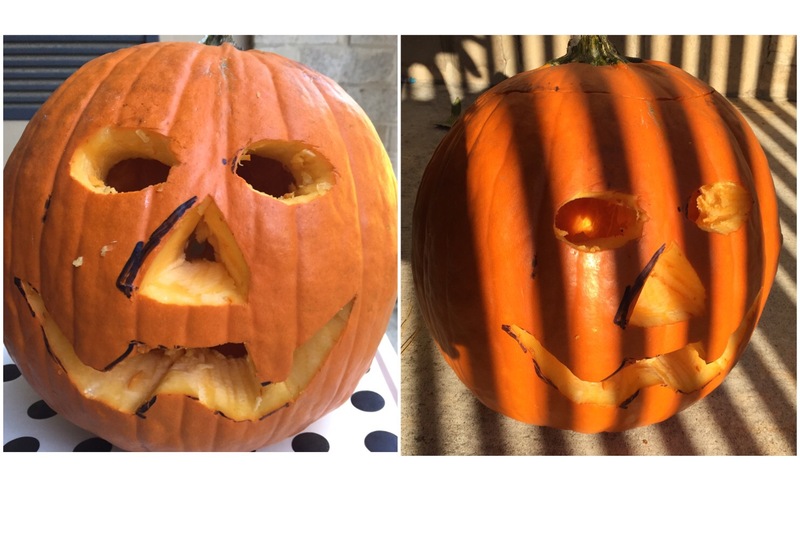 Today the sun awakened the spirit inside the pumpkin and turned it into one-eyed monster. The above post is written for the photo challenge: Shine : Has something bright or reflective caught your eye in the moment? As she stood at the lighthouse enthralled , the waves crashing the shore applauded her victory , the cool breeze soothed her past troubles, the vast ocean reflected her free spirit, and the dark blue sky made the scenery surreal. At that moment her entire life flashed before her eyes: how her wanderlust rusted while she survived an abusive marriage, raised children, and worked at two jobs to make ends meet; how she secretly kept saving money ; how she left her husband after her children became financially independent; and how she finally got the courage to realize her childhood dream. Today, on her 50th birthday,with tears rolling down her eyes, she checked off the first place in her World travel itinerary. P.S: The above post is written for ‘Three line tales: Week Thirty-Eight’ challenge by Sonya, the author of ‘Only 100 Words’ blog. Thank you, Sonya, for hosting this challenge. To read more posts for this event, click here. He looked around searching for a duck. Alas! I couldn’t stop his fall. The speciality of the above limerick is it uses homonyms . (‘duck’ and ‘fall’) . Homonyms are words with multiple meanings. P.S: The above limerick is written for Limerick Challenge Week 42: ‘Homonyms’ . Thank you Rashmi for hosting this challenge .